Use the tabs at the top of the page to choose a workout from the NHS Fitness Studio's selection of online exercise videos. Take your pick from 24 instructor-led videos in our aerobics, strength and resistance, pilates and yoga categories. The workouts have been created by fitness experts InstructorLive and range from 10 minutes to 45 minutes. There are exercises to tone your abs, raise your heart rate, tone your upper arms and much more. If you've recently had a baby, the postnatal yoga might be for you. There's also Wake up! workout, Yoga with LJ, and Belly dancing for beginners to get you moving. All of these exercise routines count towards the Government's recommended weekly physical activity guidelines. Regular exercise has been proven to help you to reduce the risk of chronic illnesses such as heart disease, type 2 diabetes and stroke. Research shows that physical activity can also boost self-esteem, mood, sleep quality and energy. 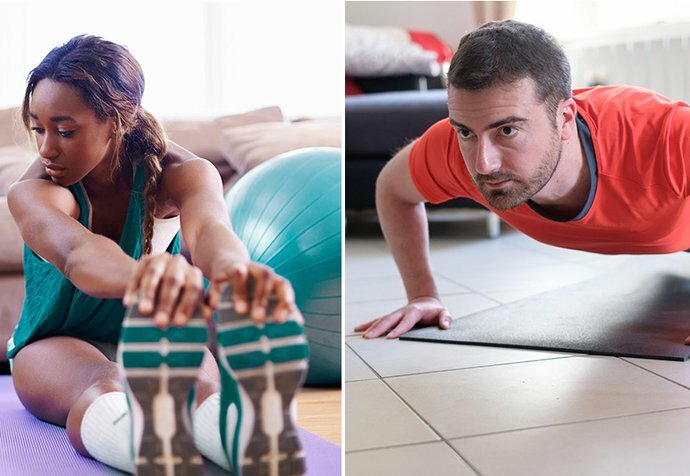 For more free exercise ideas, check out our other popular exercise programmes, such as the Couch to 5K running plan for beginners, Strength and Flex podcast and the 10-minute workout series.